1. In a large pan with water, boil the mussels until the shells open. Remove from heat. 2. Remove the shells and the hairy part of the mussels, then slice each mussel in half. 3. In a saucepan over medium heat, put the margarine until melted. Add the onions and garlic and cook until transluscent. Add the tomatoes and continue cooking until the tomatoes are soft, around 10 minutes. 4. 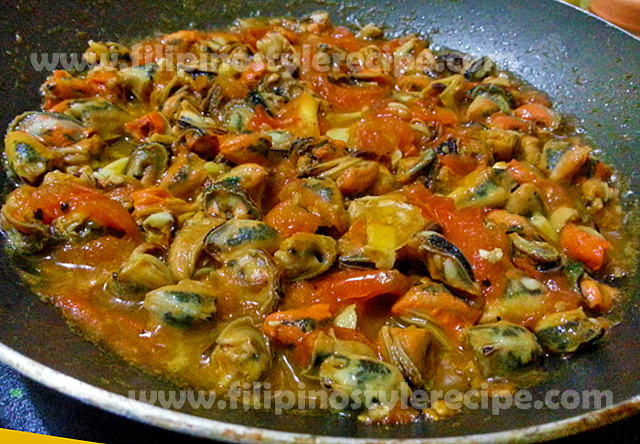 Add the sliced mussels, season with patis and pepper. Remove from heat. 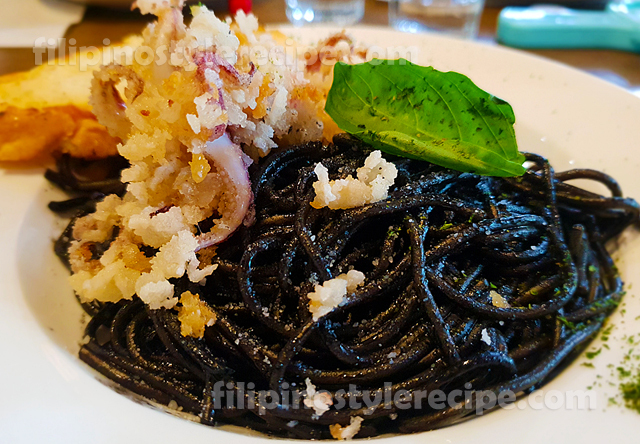 Serve with rice and enjoy. 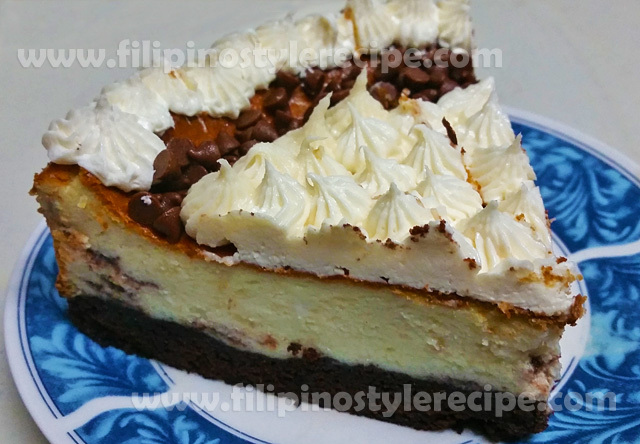 This is a twist from the regular Oreo cor Graham crusted cheesecake that we usually have. You may also use the brownie recipe posted here (http://filipinostylerecipe.com/2014/04/chewy-brownies/) if you don’t have a boxed brownie and just cut the recipe ingredients in half. 1. Grease bottom of 9 inch springform pan. Prepare brownie based on package instruction . Spread evenly on the prepared pan and bake in preheated oven at 350 degrees for 5 minutes less than stated in the package.Remove from oven and let it cool while preparing the cheesecake. 2. In a large mixing bowl, beat the cream cheese and sugar until smooth. Add eggs, sour cream, vanilla and mix until well combined. Add flour and mix until just combined. 3. Cover the chocolate chips with flour to avoid from sinking into the bottom. Fold in the chocolate chips into the cheesecake mixture. 4. Pour the cheesecake mixture over the brownie crust and bake for 45 minutes. Open the oven and let the cheesecake sit for 30 minutes to an hour before removing i. Cool completely before putting in the refrigerator. Love cheese? 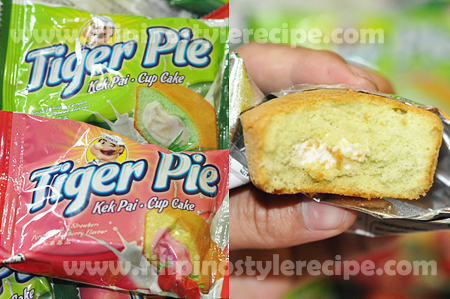 Then this yummy treat is for you. 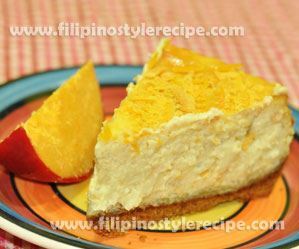 Your favorite cheesecake is even made more cheesy with grated queso de bola. 1. In a bowl, mix together the crushed grahams, butter and sugar until the mixture is moistened. 2. Press the mixture into round cake pan. Chill in the refrigerator while preparing the filling. 1. In a mixing bowl, combine the cream cheese and sugar. Using a mixer, beat together until well combined. 2. Starting at this point, all mixing will be done by hand and spatula. Add one egg at a time and mix until just combined. Add the sour cream, flour and vanilla, and mix until combined. 3. Pour the cream cheese mixture into the prepared crust. 4. Bake in preheated oven at 350 Fahrenheit for 60 minutes. After baking, let it stay in the oven for at least 2 hours. 5. 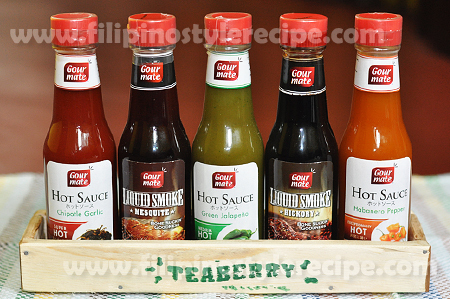 Chill in the refrigerator until ready to serve. Top with the remaining queso de bola. 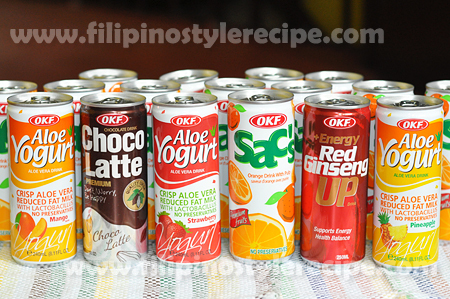 Filipino Style Recipe: I just happened to have some yogurt in the fridge so I looked for a recipe where I can use it. Luckily, I saw this recipe and I just knew this would be a good muffin. 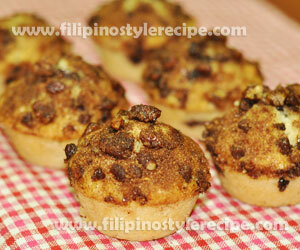 The yogurt made the muffins so moist and the chocolate chip/cinnamon topping gave them some twist. I also added chopped pecans on the toppings for some crunch. 1. In a medium bowl, combine yogurt and baking soda.Mix and set aside. 2. In another bowl, mix eggs, oil, and vanilla until well combine. 4. Pour batter in greased muffin pan. 1. In a bowl, combine all ingredients for the toppings. Sprinkle on top of the muffins. 2. Bake muffins in preheated oven at 350 degrees Fahrenheit for 20 minutes. 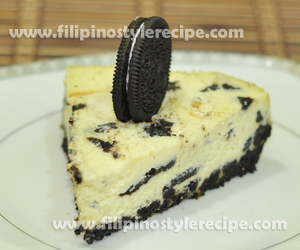 Filipino Style Recipe: Oreo Cheesecake is one of the favorite cheesecake by most of us. The slight bitterness of the Oreos balances so well with the sweetness of the cream cheese and sugar. 1. Remove filling of Oreos and put into ziploc then crush 2 packs into slightly coarse crumbs. In a bowl, mix the Oreo crumbs and butter until well combined. Press into the bottom of a round 9 inch springform pan then chill in the refrigerator while preparing the filling. 2. In a big bowl, mix cream cheese and sugar until well combined. Add vanilla and mix again.Add the eggs one at a time mixing using the hand until just combined. DO not over mix. 3. Set aside around 8 pieces of the remaining Oreos for topping. Remove the filling of the remaining oreos and break into pieces. Fold into the cream cheese mixture. 4. Pour the mixture into the prepared crust. Bake in preheated oven at 350 degrees Fahrenheit for 45 minutes. 5.After cooking, open the oven slightly and let the cheesecake cool inside for about 2 hours. 1. Remove the cheesecake from the oven, top with the remaining Oreos and refrigerate before serving. 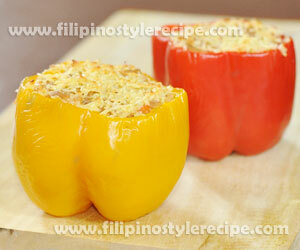 Filipino Style Recipe:This stuffed bell pepper recipe is very simple and easy to do. Different colors of bell pepper to will definitely make your table festive and there’s just about the big bell pepper that looks so elegant. You may add more or less cheese based on your preference. boiling water and let it boil for 5 minutes. Remove bell pepper from pot, drain, and sprinkle inside with salt. 2.In a pan, saute onions and beef until browned. Add the tomatoes and continue cooking for 5 minutes.Season with salt and pepper.Add cooked rice and worcestershire sauce and mix until all are combined.Remove from heat and stir in parmesan and cheddar cheese (remove around 1 tablespoon of cheese for topping). 1. Stuff each bell pepper with the cooked beef mixture and top with remaining cheese. Cook in preheated oven at 350 degrees Fahrenheit for 30 minutes. 2. Remove from oven, serve, and enjoy! 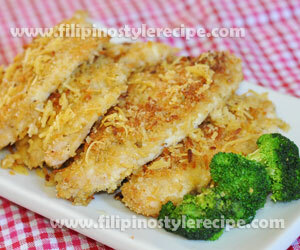 Filipino Style Recipe:Garlic Cheddar Chicken is another chicken dish that you can serve to have a variety from your all time fried chicken. It has lots of cheese so your kids will surely love. 1. In a pan over low heat, melt butter then add garlic. cook until the garlic is tender. Set aside. 2. In a wide bowl, mix bread crumbs, cheddar cheese, Parmesan cheese, salt, pepper, and dried oregano. 3. Brush or dip each chicken with the garlic butter mixture then press into the cheese mixture. 4. Arrange chicken in a baking dish. Drizzle any remaining butter and sprinkle any remaining cheese mixture. 5. Bake in preheated oven at 350 Fahrenheit for about 30 minutes. Once cooked, remove from oven, server and enjoy!